NBM v3.0 products have different characteristics from the previous v2.0. Coupled with the new “ToD” paradigm and new weather elements, the new NBM v3.0 results in big changes to forecast operations. This lesson starts with a five-minute video that describes these changes. Then to illustrate how forecast operations will be affected, we follow forecasters through important parts of a day shift, using NBM products to predict a winter storm. This quiz is very challenging for me being a trained storm spotter for only 3 years..but im getting closer to passing it.. The question with the short-range through long-range forecasts was confusing. Otherwise good overview of NBM v 3.0. Nice overview of some of the new capabilities. It would be nice to see the utilization of the other new products in a future lesson. Excellent Tutorial on the updates of NBM v3Easy to understand . 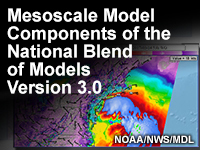 Identify at least three new mesoscale model components of the NBM Version 3.0. Identify at least five new products in NBM Version 3.0. Describe the operational impact of the “Time of Day” NBM paradigm.